Home 2017 March 26 MAKE AMERICA SAFE AGAIN! The safety pin is a movement that I wish was talked about more now that Trump is president. I feel like walking around with a safety pin on your clothing isn’t embarrassing at all. Each and every minority group should wear one, no matter what your race or ethnicity is. We should all have a right to feel safe in our city, state, and in this country. The fellow american people should not fear President Trump, no matter what he tries to do we shall stand together and fight through this movement until things get better. It is important that we stand up for ourselves and not be afraid or ashamed of what we are or give up on this movement. One thing to remember Trump was a regular U.S. citizen just like us. He may have brought out some supporters of his true colors, like racism, injustice and all, but don’t give up. We have came a long way, let’s not stop now! I am a African- american female who is hoping for change. I support the safety pin movement. MAKE AMERICA SAFE AGAIN! by Brianna is licensed under a Creative Commons Attribution-ShareAlike 4.0 International License. I think the safety pin movement is a great way for people to find a safe space because they way we living now is crazy so this is very important. “We should all have a right to feel safe in our city, state, and in this country. The fellow american people should not fear President Trump, no matter what he tries to do we shall stand together and fight through this movement until things get better”. This quote stood out to me because it’s a lot of people out here that don’t feel safe cause trump is the president and they scared to say something about it or stand up to it. Thanks for your writing brianna cause i look forward to seeing what u write next because this was a very interesting topic. I agree!! 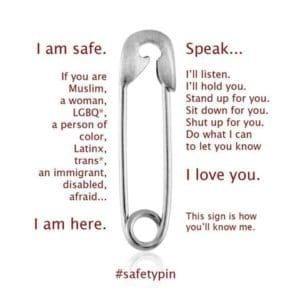 Safety pins will make more people feel safe and comfortable around others because we never know what Trump has influenced his supporters to do or think of certain races and religions.